We just won a Hague Abduction Convention case in Sweden, working with Swedish counsel, and obtained an order to return the abducted children to Japan. Of the greatest importance, the Swedish court granted our express application that our client, the left-behind parent, is the parent who will take the children back to Japan. Japanese family law is extremely weak. Child custody orders in Japan are essentially unenforceable. 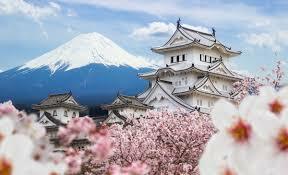 Japanese law applies the one-parent rule, whereby only one parent is permitted to have custody of a child. Visitation rights are minimal and unenforceable. For these reasons, the parent who is in possession of a child in Japan is usually, by default, the custodial parent. This has to be explained, and proved, usually by expert evidence, to a court handling a Hague petition seeking the return of a child to Japan. It is often also necessary in such cases to handle suggestions from the abducting parent or the court about undertakings. These are provisions that impose conditions of the return of an abducted child. They might, for example, require that, before a child can be returned to Japan, a Japanese court should issue an order concerning the terms under which the parties should reside prior to the issuance by a court in Japan of a comprehensive custody order. Such conditions are completely counter-productive and entirely naïve when it comes to the return of children to Japan. Japanese courts do not issue such orders and, even if they did, they would be unenforceable. 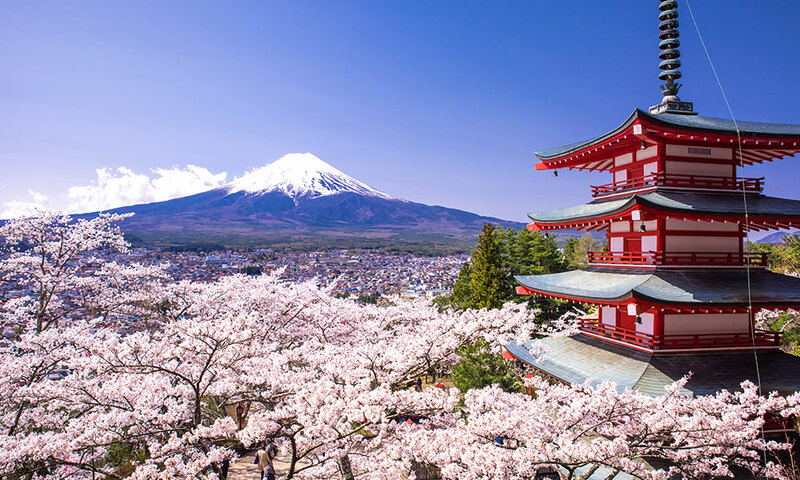 For these reasons, it is critical to ensure that the focus is on which parent will take the child back to Japan because the reality is that legal system in Japan is essentially a vacuum when it comes to child custody and visitation. Basically, whoever possesses a child in Japan has de facto custody. 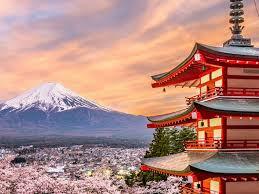 Jeremy D. Morley handles numerous cases concerning Japanese family law. He lectured earlier this year on such issues at the Japanese Foreign Ministry and has frequently been called as an expert witness on Japanese family law in courts throughout the world. 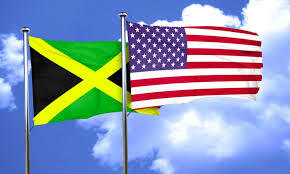 On April 1, 2019, the 1980 Hague Convention on the Civil Aspects of International Child Abduction entered into force between the United States and Jamaica. The United States now has 79 partners under the Convention. The Arizona Court of Appeals has rendered an extremely significant new decision on the admissibility and reliability of an international family lawyer’s expert testimony concerning the laws and practices of a foreign country concerning child custody and abduction. Lehn v. Al-Thanayyan, dated March 7, 2019. 2019 WL 1070824. 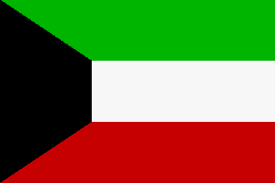 The case concerned a Kuwaiti father with permanent residency in the United States, his wife who was a U.S. citizen, and their two children, of dual Kuwaiti and U.S. nationality. They had previously lived in Kuwait but, with the father’s consent, the mother and children had relocated to Arizona while the father remained in Kuwait but visited the U.S. regularly. The mother requested that the father’s parenting time occur only in Arizona because she feared that if he were permitted to take the children to Kuwait, he would not return them to the United States. Mother also requested that the father be ordered to surrender his passport and U.S. permanent resident card to his attorney before exercising parenting time in the U.S. I submitted an extensive expert report on the Kuwaiti and international family law aspects of the case. I provided an opinion that if the father were to take the children to Kuwait and keep them there, then, notwithstanding the issuance of orders requiring return or access by courts in Arizona, it would be exceedingly difficult and most likely impossible for the mother to secure the children’s return home from Kuwait. I also stated that, in my opinion, if the Father had unsupervised access to the children in the United States, he would likely be able to take them to Kuwait or elsewhere notwithstanding the issuance of preventative measures imposed by the Arizona court. I then testified at the trial remotely and was subjected to through cross-examination. “Morley testified that he worked exclusively on international family law matters, including international child custody matters, international child abduction prevention, and recovery of internationally abducted children. He explained that his opinions about Father were based on facts provided by Mother and Father’s expert, and he acknowledged that his opinions may lack foundation if those facts were incorrect. The factual statement Mother provided to Morley, however, was substantially consistent with her trial testimony. Therefore, viewing that evidence in the light most favorable to affirming the decree, see Boncoskey, 216 Ariz. at 451 ¶ 13, Morley’s opinions did not lack foundation. 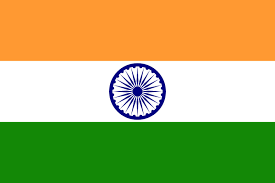 I am pleased to have been accepted again as an expert on the child custody laws and practices of India in international child abduction cases by a court in Canberra, Australia. I testified yesterday as to the recent decisions of the Supreme Court of India, including the most recent case of Lahari Sakhamuri v Sobhan Kodali. On Tuesday, The New York Times published a report on Bethany Vierra, a 31-year-old American woman whose cousin said she has been trapped in Saudi Arabia with her 4-year-old daughter since divorcing her Saudi husband. In Saudi Arabia, women are controlled by male "guardians" who must sign off anytime they want to leave the country. Even though she is divorced, her husband still has that power and has reportedly refused to let her return to the US. Even if Vierra manages to find a way to get around this rule herself, her ex-husband will maintain the power to keep his daughter, a legal expert told INSIDER. The outlook is not looking good for the American woman whose ex-husband is reportedly not letting her leave Saudi Arabia. Legal experts told INSIDER that even if 31-year-old Bethan Vierra escapes the country, she could have to leave her 4-year-old daughter behind. On Tuesday, The New York Times published Vierra's story, whose cousin said she has not been allowed to leave the country with her 4-year-old daughter, Zaina, since divorcing her Saudi husband a year ago. Vierra's cousin declined to comment to INSIDER. Saudi Arabia's guardianship laws assign a male relative control over every woman. Though she is divorced, Vierra's husband is still her guardian, maintaining control over her ability to travel internationally or get a job. Her cousin told The Times that Vierra tried to come back to Washington state to spend Christmas with her family, but her ex wouldn't allow it. Vierra's case is somewhat unique in that she is a foreigner. Usually after a divorce, a Saudi woman's guardianship passes back to her father, or to her closest living male relative. It's possible that Vierra's ex remains her guardian because she has no Saudi male relative for her guardianship to pass to. Even if Vierra were able to leave the country herself, either through permission from her ex or through petitioning the local courts, there's little hope that she'll ever be able to take her daughter with her because the girl's biological father will remain her guardian until she marries, and the Saudis don't recognize Zaina's dual citizenship. While women can sometimes petition to get a new guardian, these situations are usually narrowly tailored to women whose male guardian has grown too old for the responsibility, according to Human Rights Watch. In the vast majority of cases, a girl's father is her guardian at birth and the only time it transfers is when she marries, and even then her guardian must sign off on her suitor, according to HRW. If her husband dies before her, the woman's guardianship passes to another male relative. Jeremy Morley, founder of an international family law practice in New York, told INSIDER it's highly unlikely Vierra could get a new guardian for her daughter Zaina. She would have to show a "heavy burden of proof" that her ex is mentally ill, a criminal, or not fulfilling his guardian responsibilities — and even then Zaina's new guardian would just be another male member of her father's line, Morley said. Zaina's dual citizenship won't help her, either. Though the girl was born in Saudi Arabia, her mother's American citizenship passed to her at birth. But the Saudi government doesn't recognize dual citizenship, so she'll get no special treatment if her mother finds out a way to leave and tries to take her with her, without the permission of the girl's father. Robert D. Arenstein, a New York-based lawyer who has tried over 400 international child custody cases, called the policy "very chauvinistic." "Unless she can get out of Saudi Arabia in some way, which is not necessarily going to happen, I would tell her to try and stay with the child and get a lawyer that does Sharia law to help her out," Arenstein told INSIDER. Saudi Arabia has made it somewhat easier for women to petition for custody of their children in the last year, not requiring them to file lawsuits and go through the court Saudi system like in the past. But Vierra would still have to apply for custody of Zaina. When couples divorce in the US, state law determines the process for who gets custody of the children. If it's disputed, courts often decide based on the "best interests of the child." Morley said Vierra can petition a court in her home state of Washington to take the custody case, but even then there's "no chance whatsoever that the Saudi courts will pay attention to an American ruling." "She is in desperate trouble," he said. "She can ask for political help. That is all I can see beyond begging for mercy from her husband. Make promises to him that she will treat him in a certain way, or give him something else that he wants." And if that fails, "she can possibly find a very dangerous way to be smuggled out of the country." The State Department declined to weigh in on Vierra's case to the Times, citing privacy rules, but the department's deputy spokesman, Robert J. Palladino, did address the issue generally at a press briefing on Tuesday. 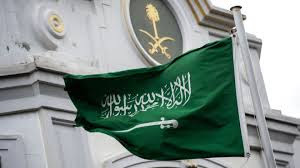 Palladino said that anytime an American travels overseas they're "subject to the laws of the country in which they travel," including Saudi Arabia where women require their guardian's permission to leave the country. "We routinely encourage American citizens to make sure — to read — what we publish and to understand the laws of the countries to which they're visiting," Palladino said. He added: "We engage with the Saudi government and all nations on [women and girls rights'] issues. It's something that we do routinely in our diplomacy. It's something that we continue to stand up for and something that is part of what we as the diplomatic corps do globally." I will address the issue of Japan’s failure to enforce return orders and the differences between the interpretations and applications of the treaty in the two countries. I will assert that, in the current environment, the Convention cannot adequately protect the competing rights of parents and children in the case of abductions of children from the United States or other countries to Japan. I will further explain that the U.S. State Department’s designation of Japan as “noncompliant” with the Convention, while technically accurate, addresses only the most superficial of issues that are relevant to these matters. I will also explain how Japan’s adoption of the Hague Convention without addressing the basic issue of the right of both of a child’s parents to have their children in their lives has often proven counter-productive not only to non-Japanese parents who wish to see their own children but also to expat Japanese parents who wish to bring their children to visit Japan or to live in Japan if that is in the children’s best interests. U.S. 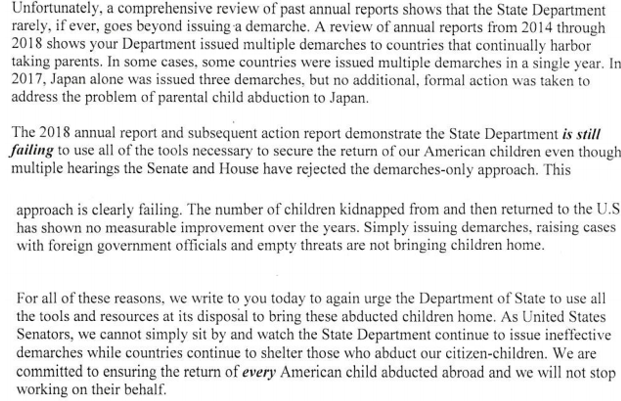 Senators Feinstein and Tillis have written to Secretary of State Mike Pompeo urging him to increase efforts to bring abducted American children back home to the United States by using all of the tools and resources at the State Department’s disposal. They have specifically criticized the State Department for issuing mere diplomatic protests known as “demarches” against countries who have been identified by the State Department as noncompliant. They directed their comments, in particular, at the failure to take more serious action against Japan. I have appeared as an expert witness on many occasions concerning Japan’s laws and practices concerning child custody and child abduction, and will discuss these matters in detail during my forthcoming visit to Japan. I am pleased to have been accepted as an expert on international child custody laws and the procedures of Minnesota by an Ontario, Canada court in a Hague Convention abduction case. Recent Update: The Canadian court accepted my testimony and accordingly refused to accept the abductor’s grave risk claim and ordered the child’s return to Minnesota. I am pleased to announce that, at the invitation of the Ministry of Foreign Affairs of Japan, I will be lecturing on the Hague Abduction Convention in Japan in the last week of February to the Ministry of Foreign Affairs and to invited lawyers’ groups in both Tokyo and Osaka. The lectures will focus on comparisons of the U.S. and Japanese approaches to the Hague Abduction Convention and of the U.S. and Japanese approaches to child custody. I have provided extensive evidence on such issues to courts in the U.S., Canada and Australia. Marrying a Swede? Or Swedish and Getting Married? Don’t You Need a Prenuptial Agreement? Why do we recommend that a party with assets who is entering into an international marriage with a Swedish citizen or resident should always consider entering into an international prenuptial agreement? Because the law of Sweden concerning the division of assets upon a divorce is unusual and can be devastatingly unfair to unprotected spouses who have significant premarital assets. Fundamentally, without a prenuptial agreement, everything that each spouse owns, in whatever form and wherever it is located, is normally treated as marital property, at least as of the time a divorce case is commenced. 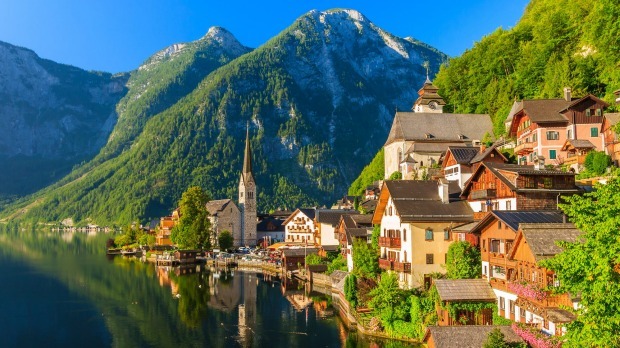 There is normally no limit on the length of time the assets were owned before the marriage; no consideration to whether the assets were inherited from family members; and no consideration to the steps taken by the owning spouse to acquire the assets. Technically, the Swedish system is that of a deferred community property regime. This means that, upon marriage, each spouse continues to own and administer all of his or her property throughout the marriage, but that each of the spouse has a special claim, called a “right in deferred community property,” to the assets of the other spouse. It is an implied right to one-half of the value of both spouses’ marital property (including premarital assets), after deduction for debts. This means that when the regime is dissolved upon a divorce, the value of the marital property is to be shared equally between the spouses. Accordingly, upon a divorce the assets will normally be divided equally between the spouses, without regard to the length of the marriage, the nature of the relationship, the contribution of either party to the source or the growth of the assets, or any other factors of fairness. If the parties are unable to agree on the details of the asset division, the determination is made by a Property Division Executor, who is usually a lawyer. The spouse with the most marital property may choose whether the difference shall be equalized by a lump sum payment or by means of a transfer of assets of equivalent value. The economically disadvantaged spouse may normally take over the joint home and the household goods, provided the other party is provided with compensation. A spouse who is dissatisfied with the Executor’s decisions may appeal to the District Court, and that court has certain powers to take considerations of fairness into account. As I have so frequently recommended, it is always prudent for international couples who plan to marry to consider making an international prenuptial agreement. And the benefits of prenuptial agreements are generally multiplied when the parties are from different countries or have assets overseas or are living overseas. But all of that applies very much more so whenever there is a possibility that the future spouses might end up divorcing under Swedish law. In order to avoid the harsh results of Swedish family law, many Swedish couples choose to remain unmarried. For those who do marry, prenuptial agreements are extremely common. Prenuptial agreements are generally enforced in Sweden. There is no requirement as to form or legal representation except that they must be in writing. They must be registered at a district court which then procures registration in a national register. Swedish courts have the power to make an award in derogation of the prenuptial agreement in order to avoid unreasonableness but if the spouses entered into the contract with full knowledge of what they were doing that power is quite limited. Spouses may include a provision choosing the law of the country that is to govern their property relations, provided they choose the law of a country in which at least one of them was domiciled or a citizen at the time of the contract. Act of 1990 on International Questions concerning Property Relations between Spouses, sec. 272, para. 3 (1990) (Swed.). Absent such a choice of law, the prenuptial agreement is governed by the law of the state in which the spouses established their domicile at the time of their marriage. Act of 1990 on International Questions concerning Property Relations between Spouses, sec. 272, para. 4(1) (1990) (Swed.). Foreign prenuptial agreements will be enforced in Sweden if entered into in compliance with the law that governed the spouses' property relations at the time of the agreement. Act of 1990 on International Questions concerning Property Relations between Spouses, sec. 272, para. 5 (1990) (Swed.). The Law Office of Jeremy D. Morley handles international prenuptial agreements globally, always working with local counsel as appropriate. We work closely with counsel in Sweden on prenuptial agreements for couples who are concerned that their divorce case might possible end up in Sweden. We commence all such matters with a consultation, usually by telephone. 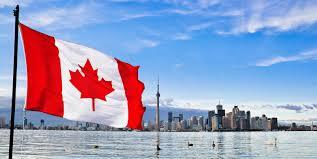 We consult on these matters with clients throughout the world. Contact us at info@international-divorce.com. 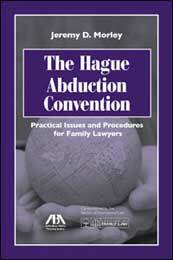 Although Jamaica has adopted the Hague Abduction Convention, its accession has not yet been accepted by the United States, United Kingdom or Canada. Accordingly, the Convention is not in force between Jamaica and these countries. The Child Protection and Family Services Agency has complained that the failure of these key countries to accept Jamaica’s accession limits how much the agency can do to rectify cases where children have been abducted and taken to foreign countries by a parent. Speaking to Jamaica’s Gleaner newspaper, the agency’s legal office, Nicole Chambers, said the agency has at least 15 child abduction cases so far, but pointed out that this represents only a small fraction of them. She said that it was frustrating to "to explain to persons that we have domestic legislation in place, we have the court in place, we have a designated Hague-approved judge, but you cannot make your application under the convention because the country where your child is, that country has not accepted Jamaica yet for us to make that application." 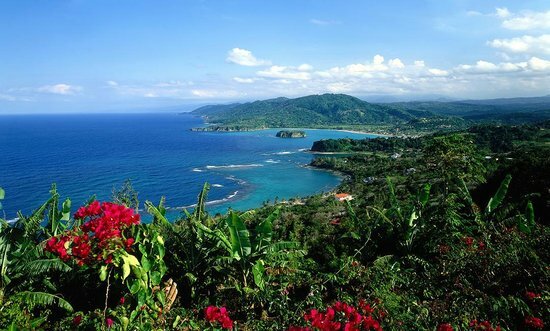 · The legislation empowers Jamaica’s Central Authority to refuse an application whenever it decides that the application is not well founded. · The legislation does not state how cases are to be brought to court and does not explain the jurisdiction of the Court if the Central Authority has determined that an application is not well founded. · The legislation subordinates the Convention to broad provisions in Jamaica’s Constitution, thereby authorizing or requiring a refusal to return abducted children for far more extensive reasons than are permitted by the Convention.